there is simply no better resource on the market. 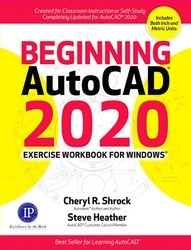 For more than two decades, the Beginning AutoCAD® Exercise Workbook has been THE definitive tutorial for those learning and teaching about the CAD software. And as the AutoCAD package has continued to improve, so has this work, with better graphics, enhanced standard features, and additional practical exercises. This top-selling Workbook includes a dynamic feature called “CAD Tips” interspersed throughout the lessons to provide insider information from longtime AutoCAD experts. Side-by-side inch/metric measurements make the work accessible to AutoCAD users around the globe. Dark and light theme, causing the command buttons to stand out more, and making the interface look more like the Windows 10 operating system dialog box appearance. New Blocks Palette, allowing users to view the blocks before inserting them, and offering the ability to insert blocks from current, recent, and saved drawings. the 3D Modeling Exercise Workbook.